It would be hard for the Orioles to be much worse than they were in 2018, but it's also still going to be a while before they're competitive again. The questionable foul ball call when Nate McClouth pulled one to right field and nearly tied a playoff game against the Yankees in the Bronx. Delmon Young delivering a bases-clearing double against the Tigers back in the 2014 ALDS that sent Camden Yards into a frenzy you could hear from Pikesville. Buck Showalter’s decision to leave his best reliever, Zac Britton, in the bullpen during a crucial moment in extra innings during a one-game playoff against Toronto. All those are memories of a time when the Orioles were contenders for not just the division, but the American League pennant. Entering 2019, all that’s left from that 2012-2016 stretch during which the Orioles didn’t have a losing season is Chris Davis, who had such a historically bad 2018 that a bar in Canton tried to encourage him through superstition by offering free shots to patrons any time he got a hit. Right now, the Orioles are in the midst of a full scale, ground up rebuild. 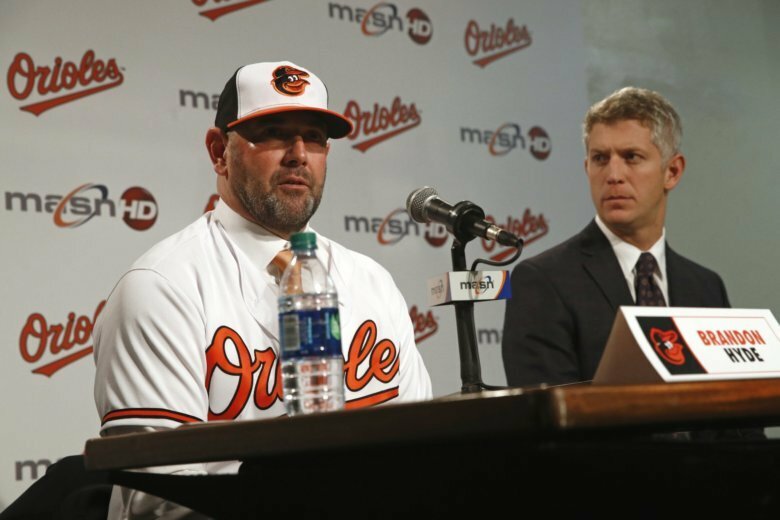 New GM Mike Elias brings a Yale education and previous rebuilding experience to Baltimore. Elias won the World Series in 2017 as the Assistant GM of the Houston Astros, just four years after the franchise won an MLB-worst 51 games. Elias now joins the ultracompetitive AL East — such a strong division that the third place 90-72 Rays could not even qualify for a Wild Card berth in 2018 — inheriting a team that won just 47 games last year. Replacing the legendary Showalter is Brandon Hyde, who was the bench coach to Joe Maddon for four years in Chicago. Unfortunately for the rookie manager, he won’t have the most consistent hitter for Baltimore in the past 20 years to help him guide the younger players through the rebuild. After 11 seasons donning the orange and black, Adam Jones signed with the Arizona Diamondbacks in the offseason, leaving the everyday center field job to Cedric Mullins in 2019. Elias and Hyde won’t have to answer any questions this year about the fate of their star former infielder Manny Machado who, according to him, was not shown any love when he was dealt to Los Angeles. Machado inked the largest free agent contract in MLB history with the San Diego Padres to the tune of 10 years and $300 million. With the team nearly 70 games below .500 last season, the Machado trade was officially the white flag of surrender for the Orioles as a team trying to “win now.” Following the Machado move, the team shipped Britton up to the rival Yankees, fellow relievers Brad Brach, Darren O’Day and starter Kevin Gausman were dealt to Atlanta, and Manny’s best friend Jonathan Schoop was sent to Milwaukee. Cobb was supposed to be this year’s Opening Day starter, however a groin injury landed him on the disabled list to start the season. Instead, he’s got an eye on making his 2019 debut in the home opener Apr. 4. Hopefully this injury does not catapult into another rough start like he had in 2018, when he signed just before the start of the season. Cobb failed to record a win until his seventh start of the season but he did eventually settle in, allowing more than three earned runs just once in his final 11 starts. Cobb is a 31-year-old veteran with a sub-4.00 ERA in his career. A contender looking to bolster the middle of their rotation could benefit from catching Cobb in the midst of a healthy midseason groove. Cashner will be the team’s Opening Day starter at Yankee Stadium now. Although his 2019 spring performance was uneven, he did show off some tweaks to his curveball which was part of his pitching arsenal when he retired the final 12 batters he faced last week. Like Cobb, if Cashner has a successful run of starts near the trade deadline, he could be viewed as a solid fourth or fifth starter for a contender that can help out in long relief come playoff time. Villar has had an up and down career: he led all of baseball in steals in 2016 while setting career bests in hits, home runs, batting average, slugging and on-base percentage with Milwaukee. But he struggled in 2017, and was traded last year to Baltimore in the deal that saw Jonathan Schoop become a Brewer. The Orioles lucked out in that trade — Schoop failed to record a postseason hit in eight at-bats after hitting just .202 in the regular season in Milwaukee, while Villar seemed to be refreshed as he led the O’s with 21 stolen bases while hitting eight home runs in just 54 games. At 27 years old, Villar is at a prime age where his body isn’t worn down substantially yet and he can still run the base paths effectively. A team looking for someone to hit at the top of their order, or an NL team looking to acquire infield depth and more pinch hitting options, could surely look at a guy like Villar. Givens has had a pretty brutal spring (14.29 ERA in seven appearances) but he still has the best chance of any Orioles reliever to earn regular save opportunities. If he is able to get on a roll like the end of last year, when he did not allow a run in 15 of his final 17 appearances, a team looking for bullpen depth could do worse than the 28-year-old who has pitched 65+ games three seasons in a row and has never finished with an ERA over 4.00. The Orioles do have some prospects and young players upon which they can build their foundation, headlined by Yusniel Diaz (acquired in the Machado trade, No. 64 in MLB’s Prospect Watch). Ryan Mountcastle is the team’s No. 2 prospect (No. 71 overall in MLB Pipeline) who won’t start the season with the team but is a Major League capable hitter who was drafted as a shortstop, played third base and tried first base this spring. Outfielder Austin Hays had a strong spring but sprained his thumb, so we’ll see when he returns to the Major League level like he did in 2017 when he played 20 games for the Orioles. The Orioles will need a combination of a lot of things to even be competitive in most games in 2019, including Trey Mancini to bounce back from a something of a sophomore slump, and Dylan Bundy to stop getting lit up when he takes the mound. A lot needs to go right over the next few years for the Orioles to become relevant again in the division and in the American League. But if the Rays can finish 18 games over .500 with the lowest payroll in baseball, Orioles Magic is capable of returning to Charm City. It just might take a while.